Our Horinji (Prunus 'Horinji') is a charming small upright tree with pretty soft pink semi-double flowers contrasting with pronounced purplish-brown calyces. Its young leaves are greenish-brown. 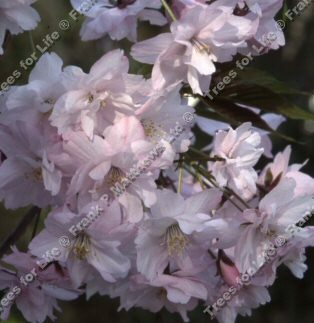 A very beautiful Japanese flowering cherry variety, that is now rare, even in Japan. A small height tree, so expect a height of up to 4 metres (13 foot) after 10 years. Grows to a vase type shape e.g. narrow at the bottom and expanding out towards the top of the tree. Horinji is supplied at a height of between 1.5 and 2.0 metres in a 12 litre container for year round planting and better results than from either bare-root or rootballed stock.